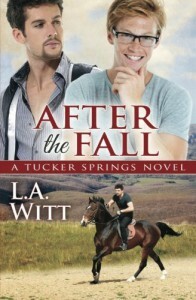 AFTER THE FALL is a sweet, funny and charming story set in Tucker Springs. Nathan has just fulfilled his dreams and has acquired Tsarina, the horse of his dreams and is taking her out for some exercise when a crazy motorcyclist scares the poor horse to death and she falls, landing straight on top of Nathan. In pain and pissed off is not a good combination for Nathan because when the motorcyclist comes to help him, he gets a punch in the face that is hard enough to draw blood. The accident, however, ends up creating a unique relation between Nathan and Ryan. When Ryan offers to help Tsarina with her training while Nathan is recovering in a cast for the next few months, a romance blooms between these two in such a way that can’t help but enjoy! First thing I have to mention is L.A. Witt’s ability to create such authentic, flowing dialogue between her characters. She is always able to infused their conversations with funny antics, personality and a dash of sensuality which I think makes it so easy for readers to devour. I read this book so fast that I was almost disappointed that it was over. Ryan and Nathan are adorable together. Ryan’s shyness and Nathan’s vulnerability is what makes reading them fun. You can tell that this romance wasn’t expected and just bloomed naturally for them and I think Witt does a great job of making it all feel believable. Though this is the sixth book in the series, I definitely think you can read this book as a standalone. There is mention of previous characters in the series but nothing that will be confusing to new readers hoping to find something new to enjoy.